Looks, smells and tastes like homemade! Turkey, Turkey Broth, Green Beans, Carrots, Apples, Lentils, Sweet Potatoes, Pumpkin, Lamb, Tapioca Starch, Sunflower Oil, Salt, Tricalcium Phosphate, Vitamins (Choline Bitartrate, DL-Alpha-Tocopherol Acetate, Vitamin A Palmitate, Niacin, d-Calcium Pantothenate, Thiamine Mononitrate, Riboflavin, Pyridoxine Hydrochloride, Folic Acid, Vitamin B12 Supplement, Cholecalciferol), Minerals (Zinc Amino Acid Chelate, Iron Amino Acid Chelate, Copper Amino Acid Chelate, Manganese Amino Acid Chelate, Iodine Amino Acid Chelate, Selenium Yeast). 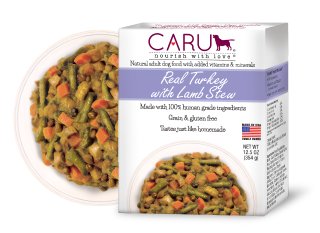 Caru Real Turkey with Lamb Stew is formulated to meet the nutritional levels established by the AAFCO Dog Food Nutrient Profiles for maintenance. Serve as a complete and balanced meal or as a topper with dry food. When fed as a complete meal, use 1 pack daily for every 12 lbs. body weight. If feeding with typical dry dog food reduce dry by 2/3 cup for every 1 pack of Caru. Adjust the amount of food fed to meet your dog’s individual needs. Always provide access to fresh water. Refrigerate for up to three days after opening. Available in 12.5 oz (354 g) packs, 12 cartons per case. Gently heat for a special treat!